24" (610mm) fully enclosed 3 blade impellor. 250 watt, 230v motor with variable 3 speed control. Durable alll steel construction with protective stove enamel finish. 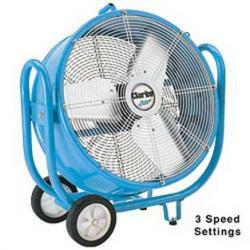 Fan & fan case oscillate through 360� within frame & operates at any required angle.